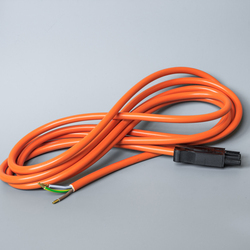 A ready to use orange power cable that facilitates procurement and installation. Orange feed cable with female connector on one end to connect to a LTLN light and an open end for the connection to power. Orange power cables for enclosure lights, LTLN. Off the shelf solution, the cable easily connects the enclosure light to the power source.